Over the past decade, Brandon Sanderson has crafted amazing fantastical worlds in his Mistborn and Reckoner novels, and even contributed to another in the form of finishing Robert Jordan’s Wheel of Time saga after Jordan’s death. But one book of Sanderson’s, White Sand, has never been released... until now. 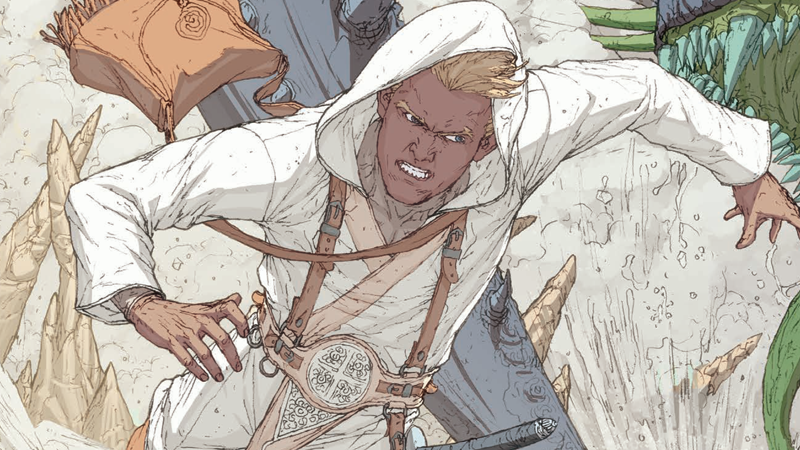 Sanderson’s unpublished novel—part of his interconnected “Cosmere” shared universe that many of his books are part of—is being turned into a three-volume graphic novel by Dynamite Entertainment, with writer Rik Hoskin, artist Julius Gopez, and colorist Ross Campbell being tasked with translating Sanderson’s novel into the graphic novel format. Set on a bizarre planet called Taldain, which has no rotation—so one side is basked in perpetual day, the other in perpetual night—White Sand follows Kenton, the seemingly sole survivor of an order of magic users called Sand Masters, as he tries to uncover the truth behind the slaughter of his fellow magical students and masters. We’ve got an exclusive preview from the first volume, which you can check out below. White Sand Vol. 1 is out in June, with the following volumes set to be released later this year.